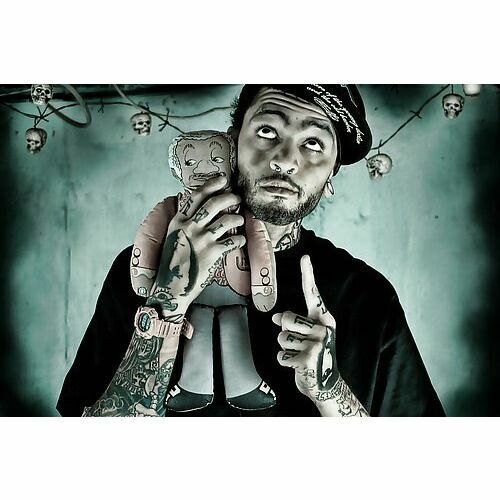 Travis Lazarus "Travie" McCoy (born August 6, 1981 in Geneva, New York) is a rapper, singer, multi-instrumentalist and lead vocalist of the alternative hip hop group Gym Class Heroes. Signed to T-Pain's Nappy Boy Entertainment, he released his solo debut album, Lazarus, on June 8, 2010. The lead single from the album, Billionaire featuring Bruno Mars, has so far reached #4 on the Billboard Hot 100. McCoy was born and raised in Geneva, New York. In high school, he met Matt McGinley in his gym class, and the two bonded over their love of music. They decided to start a band, and played with other musicians until Gym Class Heroes was formed in 2001. Travis made his MTV debut in the summer of 2002, as he appeared on stage at the beach house on a standard nation-wide MC Battle that was held on the MTV show Direct Effect. McCoy was arrested on July 1, 2008 after hitting a man on the head with his microphone. The man had been in the crowd at a concert in St. Louis when he shouted racial slurs at McCoy. McCoy asked the man, "What did you just call me?" As security was removing the man from the venue, McCoy brought the man on stage to call him out in front of the crowd. In a statement, McCoy's publicist said that the man hit McCoy in his knee, which was in a brace after he had suffered a recent strain In early March 2008, McCoy opened up about his battles with opioids. He stated that he had been addicted to pharmaceuticals since he was 15 years old. McCoy dated singer Katy Perry, who appeared as his girlfriend in the "Cupid's Chokehold" video and toured along with his band on the Warped Tour, on and off for several years. He had given a promise ring to Perry, and when asked if this was rehearsal for an actual proposal, McCoy shrugged with a grin. The two broke up in December 2008. They began dating again in April 2009. However, they broke up a few months later. McCoy is a vegetarian.